Welcome to our "BRAND" internet service. Our company provides international transportation and freight services. We were founded in 1991. Our company is continuously growing, thanks to our experience, the high quality of our services and our reliability. 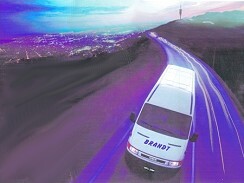 We have our own fleet of lorries and a professional staff of workers, who are constantly improving their qualifications. The purpose of the presented service is to improve the cooperation between our branches.We encourage you to order our services by filling in the special "online form". 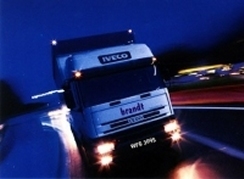 Our offer includes a complex series of services in transportation and freight. We are a member of the Union of the International Road Carriers. We are insured in OCP for 300.000 USD and we are in possession of TIR cards. 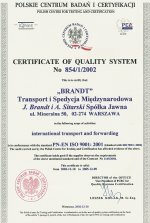 On 11.04.2002 we received confirmation of our credibility in the form of a special license for performing international transport of goods from the Polish minister of Infrastructure. 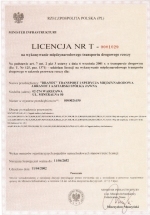 We are one of the few polish companies, who received such a license. This license is valid for 50 years. You can view the content of the license by clicking on the picture to the left. We guarantee a professional, and right on schedule realization of all orders, our loyalty and a full confidentiality. The confirmation of our credibility and quality can be seen by the great number of satisfied customers. Among them, many leading Polish and international companies. We can present the references upon your enquiry. Our company is in conformance with the standard PN-EN ISO 9001: 2001 (identical with ISO 9001: 2001) in the scope of international transport and forwarding services. You can view the content of the license by clicking on the picture to the left. Thank you for your interest.We warmly invite you to use our services, which we believe would be to our mutual benefit. We invite for active contact with our business office in Warsaw.